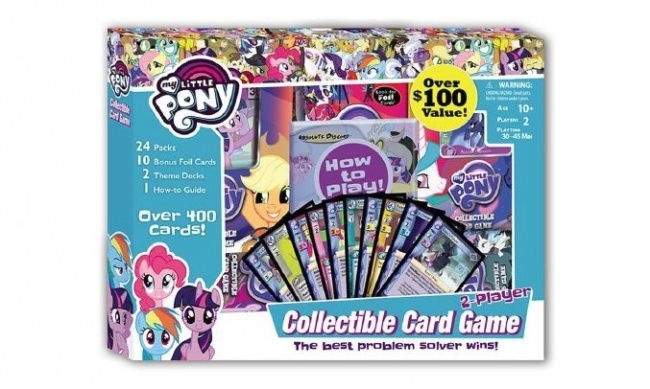 Just in time for Christmas, Enterplay will release the My Little Pony 2-Player Collectible Card Game Super Value Box. The Super Value Box offers a collection of My Little Pony CCG material, including 2 theme decks, 24 booster packs, and 10 foil promo cards, a total of more than 400 cards for the game. The foil cards include Ultra Rares and cards that had only a limited distribution when originally released. Like the My Little Pony Collectible Card Game: 2-Player Game released earlier this year (see �New �My Little Pony CCG� Releases�), the Super Value Box was created with younger and less experienced players in mind. The set includes a How to Play! guide designed for novice CCG players, and the boxed set is intended as a way for new players to get started in the game quickly. Experienced players can also use the set to help complete their collections. The Super Value Box will hit the streets in December.